VERMEYS, Nicolas W. et Karim BENYEKHLEF, « ODR and the Courts », dans Mohamed S. ABDEL WAHAB, Ethan KATSH et Dan RAINEY (éd. ), Online Dispute Resolution: Theory and Practice, La Haye, Eleven International Publishing, 2012, p. 295. Ever since online dispute resolution (ODR) processes first arose in the mid-1990s, their impact on the state’s already eroded monopoly on resolving conflicts has been the subject of much debate. 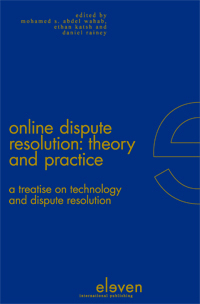 This is not to say that the rise of ODR signified the first instance in which individuals chose to settle matters outside of the courtroom – alternative means of settling disputes have been around for ages3 – but ODR offers a technological shift to dispute resolution, not merely a procedural one. Online environments have created new and unique ways (notably through the use of the so-called fourth party) of settling disputes in a swift, asynchronous (although synchronous solutions are also available), and cost effective manner. Accordingly, ODR can be seen as both a competing and complementary tool to traditional in-court schemes and state-run judicial systems.